I thought I knew what I was getting into. I was running my online business on the side; it started off as a hobby. As it became more successful, I became intrigued by the dream of leaving the corporate world and focusing on my online business fulltime. I googled “should I quit my job to start my own business”. I made a list of pros and cons. I tried to set my expectations realistically – I didn’t want to make a mistake. Expectation: Once I got it into my head that I wanted to focus fulltime on my online business, the “corporate grind” became something I dreaded. By corporate grind, I mean the mundane daily routine that corporate life can turn into. The meetings that drone on, the required training on diversity and sexual harassment, the team building activities (“forced fun”), and the ever present corporate politics. Still need a clearer picture? Think “TPS Reports” from Office Space. Reality: There is no “Corporate Grind” when you work for yourself…at least not in the traditional sense. I don’t deal with corporate politics, employee drama, or unproductive meetings. There is, however, a new “grind”, a set of tasks that you repeatedly have to do to keep the business going. This grind is different for every business. It may be the constant production of content, the responding to emails, tweets, and comments, or the continual maintenance of your Adwords account. For me, this grind is different. I embrace the grind, because I know it directly relates to the success of my business. Bottom Line: Expectation was right on…no more corporate grind. Expectation: Part of the attraction of leaving my corporate job was the freedom to set my own schedule. My typical schedule for my last job was to leave for work every morning at 7:30 am and being back home by 6:00 pm. It wasn’t a particularly grueling schedule, but it did represent 55 hours of my week that I was devoting to working for someone else. When I was considering leaving my job, I expected that I would have complete freedom to set my own schedule. I thought that I would work whenever I needed to and stop working when I was “done”. I also assumed I could “take off” whenever I needed to or wanted to. Reality: My work from home schedule is actually pretty consistent. I start every morning at 7 am and work straight until about 11 am. I then workout and have lunch. Afternoons are a mixed bag, I either work for a few hours, run errands, hang out with the family or do side projects/hobbies. On average, I put in about 25-30 hours per week at the home office…but I am constantly thinking, researching, and planning outside of my “office hours”. I am also fortunate enough that I can take a day off whenever I want, although I usually am only taking time off when I go on a family vacation or when I travel to my kids’ hockey games. 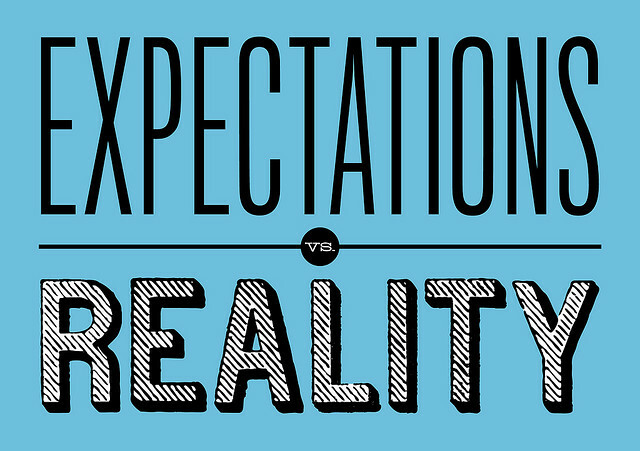 Bottom Line: Reality mostly met expectations. Expectation: One of the biggest motivators that I used to psych myself up to quit my corporate job was the “Work From Anywhere” promise. I envisioned a mobile lifestyle where I would be working on my laptop from a variety of locations: the local coffee house, my patio, on the beach, and even some exotic foreign locations. Reality: I do virtually all of my work from my home office. It’s not that I can’t work from anywhere, I just don’t…it’s a hassle. I like my home office, I’m very productive there. 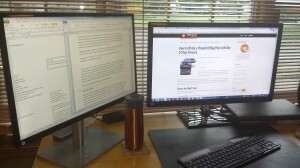 I’m not sure I could work for long periods of time without my dual monitor set up (there’s so much room for activities!). When my kids are out of the house, though, that’s a different ball game. I’m still holding onto the vision of traveling a lot for extended periods of time…and working off of my laptop (I’ll just need to be more comfortable with the smaller screen real estate!). Bottom Line: Expectation was inflated…possible but not in the near term. Expectation: One of the things that I didn’t like about the corporate life was that I always seemed to be working on things that were requested by others. Whether it was the owner, customers, or peers – I never seemed to be able to work on what I thought was important, or what I was passionate about. I expected my online business to give me the freedom to work on whatever I wanted to. Reality: For the most part, I work on what I want to. I set the priorities, I decide the effort required, I do the work. But…there is also a lot of work that needs to be done, and no one else to turn to. There are also the unexpected events (e.g., website going down, google algorithm changes, etc.) that I have to react to. Bottom Line: Expectation was mostly met. I am way more in control of what I spend my time on. Expectation: The key driver of my desire to focus on my online business was the lure of financial freedom. I’d seen plenty of my friends and colleagues lose their jobs and scramble to get another job at near the same pay. I didn’t want any part of that. The “Great Recession” of 2008 was actually one of the reasons I started my own online business on the side – I was unsure of how well the company I was working for was going to weather the storm. I expected to be fully in charge of my financial destiny, with unlimited upside and a steady stream of income that I could control. Reality: I left my corporate job about 15 months ago, so it’s too early to draw any strong conclusions on this. Luckily, my monthly income has always been at least 25% higher than what I was making at my job. A couple of months it was more than twice as much! The more challenging aspect is that my revenue stream varies widely from month to month. There are also some parts of my revenue stream that I don’t have full control over. For example, my Adsense (Google advertising) revenue can vary dramatically from day to day (irrespective of my traffic). Some days I make much more than I expected, some days a lot less. Bottom Line: My expectations were naïve, but I definitely feel more financially independent. Expectation: I fully expected my results from my online business to be directly related to the effort I put in. In the corporate world, that is not always the case. Sometimes you work on projects and you never see the results of your efforts. Surely my online business would be different, more work equals more success….right? Reality: I discovered that the relationship between effort and results was not as simple or direct as I expected. Don’t get me wrong, I still firmly believe that more effort ultimately results in better results – it’s just that the timing and the type of results are hard to predict! SEO is a classic example. I spent a lot of time optimizing my sites and building links but I had no idea of when/if I would be rewarded. I spend a lot of time “planting seeds” that I hope will bear fruit. Individually, these initiatives may not seem to be making any difference, but in totality they definitely contribute to the quality and growth of my sites. Bottom Line: My expectations were a little simplistic. Success follows effort – it’s just hard to predict. Overall my expectations weren’t wildly off-base. I knew what I was getting into, more or less. What are more interesting are the unexpected benefits and challenges that I encountered. Quality of Life – My quality of life is much better. I have time to exercise. I eat better. I sleep better. I’m happier. I can go on vacations without worrying about what’s blowing up back at the office. I didn’t consider “quality of life” to be a driving factor in my decision to leave the corporate world, but it should have been. More Family Time – My family has always been a priority. I never felt that I slighted my family because of my corporate job. What I didn’t realize, though, is that just by being home more I am much more involved in my family’s activities. I enjoy running errands with my wife. I look forward to seeing my kids come home from school. In the summer I sneak off to the pool with my kids or go golfing with my sons. Sense of Ownership – When I started making money online, it was merely a hobby. I felt good because I had extra money to use on whatever I wanted. Once I gave up my corporate salary, I realized there was no safety net. If my online business failed, I failed. This realization caused me to develop a strong sense of ownership of my online business. I now have much more pride in my results. I am now driven to make the business better – and to last. Second Guessing My Decision – I didn’t expect to second guess my decision to leave my job anytime I ran into serious difficulty…but I do. It’s natural I think, at least for me. It’s similar to the buyer’s remorse I feel after making an impulse purchase. When it happens, I just step back and focus on how much happier I am. Solo is Hard – Working by yourself is definitely challenging. I totally did not think I would miss the camaraderie of the work environment…but I do. It’s much harder to maintain a professional network when you leave a formal work environment. It’s something I still struggle with. Discipline and Motivation Varies – I’m normally a very self-motivated person. I like to be active and doing things. Some days, however, I’m at a loss over what I should be working on. Sometimes it’s because I have so many ideas that I’m excited about. Other days it’s because I recently tried a lot of things and none of them seem to have worked. When you run your own business you definitely need to keep an eye on your motivation to insure that you are working on the right things. Weaknesses are Magnified – When you are a solo enterprise, all of the weaknesses that may have gotten lost in the corporate world become magnified. If you had problems prioritizing in the corporate world, it may not have been a big deal because other people were there to tell you what to work on. When you are by yourself, it’s a huge deal if you can’t prioritize. One of my “quirks” is that I like to start a lot of things, but after a while I become bored with them. On one hand, this has helped me in my online business because I am always experimenting with new approaches to everything. On the other hand, I often find myself not following up with my experiments so that I know which ones worked and which ones were disasters. It’s a trait I always have to keep an eye on. Running an online business is definitely a journey. As you go along, I think it makes sense to stop along the way to reflect on the journey. As I look back on the last 15 months or so, I cannot believe how different (and better) my life is. It drives me to improve my business so that I can continue to enjoy my new lifestyle. Are you thinking about quitting your job to run an online business? 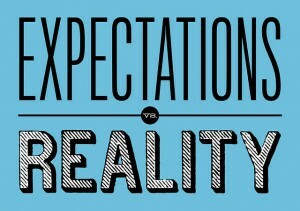 What are your expectations? What is holding you back? How long were you running your online business on the side before you left your job? About 3 years…but I wasn’t taking it that seriously until about a year before I quit my job. That’s when I decided to “go for it”. Hey there! Saw you followed me on Twitter and I returned the favor. I am in the process of this transition and am currently in the “go for it” phase while being employed. Awesome to see this post, good detail and great challenges to learn about. Ron…thanks for the follow. Had a look at your website – very nice! Hey, thanks for the follow on Twitter. I’m hoping I can follow in your footsteps. This is exactly what I need. Good luck with your efforts Rhoda!